Our marble coaster plates with complimenting base case are an elegant way of serving beverages. The floral inlay work with the elegance of marble is a perfect welcome to the special guests. 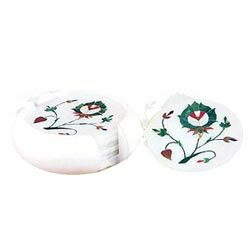 White Marble Stone Coasters with floral inlay in a round flat base case. 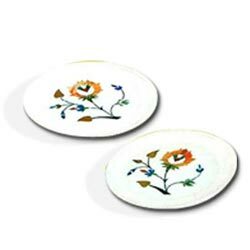 Greet your visitor with tea served on these elegant stone coasters with floral stone inlay.